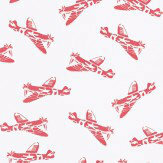 PaperBoy - High quality, crafted wallpapers designed and printed in England. 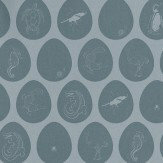 A children's wallpaper with beautiful illustrations of animals inside a geometric egg shape. Shown here in light blue colouring - more colours are available. Please request a sample for true colour match. 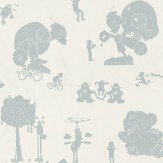 A children's wallpaper with a friendly world class robot playing various games including hide and seek and bicycle races. 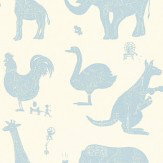 Shown here in Pale blue and white colouring - more colours are available. Please request a sample for true colour match. 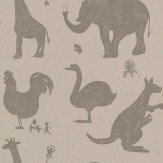 A fun design with Animal shapes filled with cartoon ideas on how they work with springs and levers. Shown in powder blue on a white background. Please request a sample for true colour match. A delightful space alien paper to inspire the space explorer in any child. Available in 4 colours - shown here in the cream and green colourway. Please request sample for true colour match. 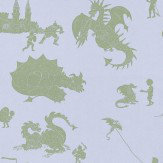 Dragons, knights and stone castles in the air – adventures for boys. Shown in green on a grey lilac background. Please request a sample for true colour match. 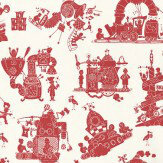 A children's wallpaper which details illustrations of machines doing various things. Shown here in Green and cream colouring - more colours are available. Please request a sample for true colour match. 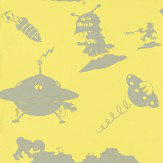 A delightful space alien paper to inspire the space explorer in any child. Available in 4 colours - shown here in the grey on vivid yellow colourway. Please request sample for true colour match. 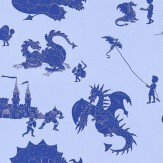 Dragons, knights and stone castles in the air – adventures for boys. 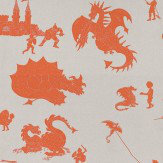 Shown in vibrant orange on a taupe background. Please request a sample for true colour match. 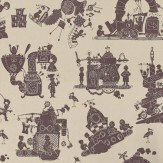 A children's wallpaper which details illustrations of machines doing various things. Shown here in red and white colouring - more colours are available. Please request a sample for true colour match. A celebration of the iconic boy's plane, the Spitfire in flight. Shown in pillar box red on white. Please request a sample for true colour match. A fun design with Animal shapes filled with cartoon ideas on how they work with springs and levers. Shown in chocolate brown on a light stone background. Please request a sample for true colour match. 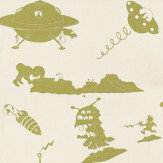 A delightful space alien paper to inspire the space explorer in any child. Available in 4 colours - shown here in the stone and purple colourway. Please request sample for true colour match. 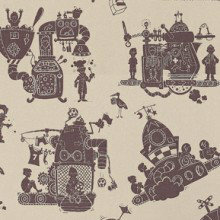 A children's wallpaper which details illustrations of machines doing various things. Shown here in Aubergine colouring - more colours are available. Please request a sample for true colour match. 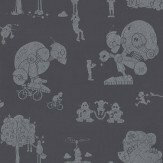 A children's wallpaper with a friendly world class robot playing various games including hide and seek and bicycle races. Shown here in Mulberry colouring - more colours are available. Please request a sample for true colour match. A fun design with Animal shapes filled with cartoon ideas on how they work with springs and levers. Shown in black on a deep purple background. Please request a sample for true colour match. 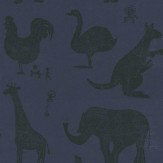 PaperBoy have a superior range of colours that are stunning & fabulous. 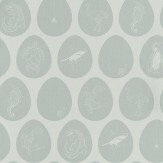 Their children's wallpaper designs mix traditional themes with a distinctly modern English twist to create a lively & vibrant interior whilst complimenting your grown-up style. 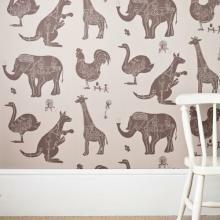 A clean contemporary cool wallpaper collection aimed at the young at heart. 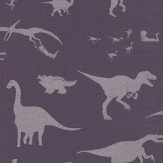 Elegant and high-quality decorative designs including a beautiful Spitfire pattern together with space, dragons, dinosaurs and animal motifs. A mix of traditional themes with a distinctly modern English twist to create a lively & vibrant interior whilst complimenting your grown up style.